With Gas Boom, Pennsylvania Fears New Toxic Legacy Industry has ruined a lot of Pennsylvania's water. Coal mining companies hammered the state, leaving behind acidic water that turned thousands of miles of streams into dead zones. People in the state are looking for ways to make sure the fracking boom doesn't deal another blow to its water. 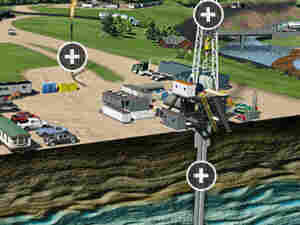 Hydraulic fracturing lets drillers tap previously inaccessible natural gas reservoirs. 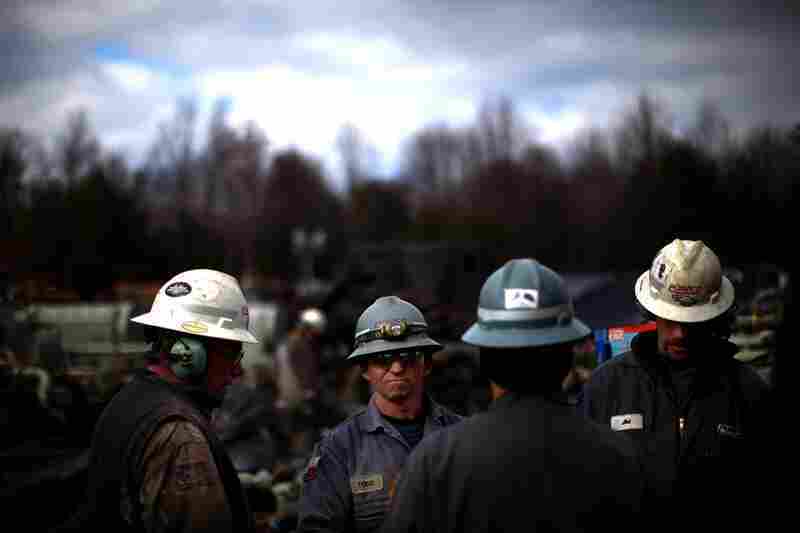 Workers at Chesapeake Energy are seen on the job near Towanda, Pa.
A successful fracking operation requires a battalion of drilling rigs, miles of pipe and millions of gallons of water in order to bore through the earth. Workers stand outside the pump room where water is separated from drilling mud at one of Chesapeake Energy's water treatment facilities. The thick muddy liquid called "flowback" — a mix of water, toxic chemicals and minerals — is a byproduct of fracking in the Marcellus Shale. 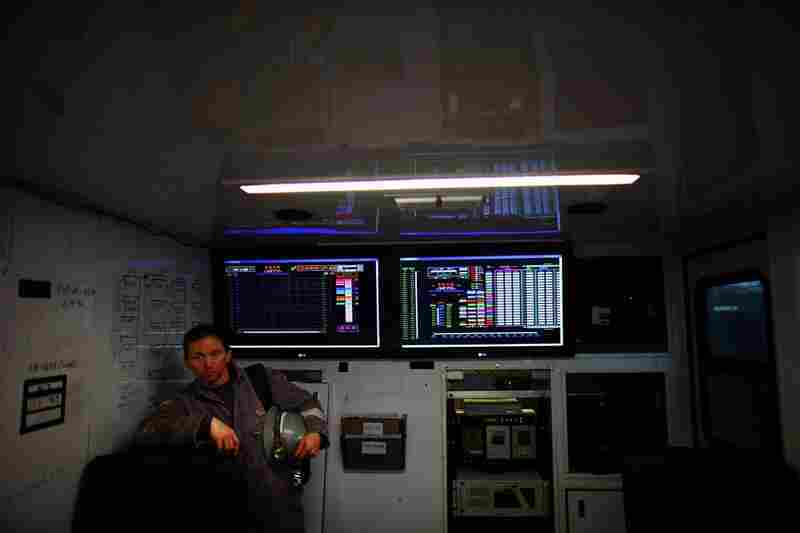 A Chesapeake Energy worker stands next to the control panel that monitors the fracking process. 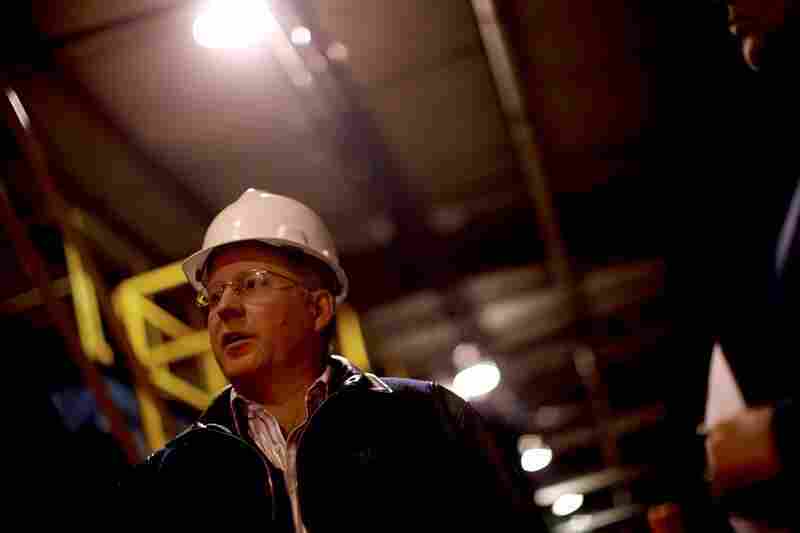 Rory Sweeney of Chesapeake Energy looks over an active drilling site. 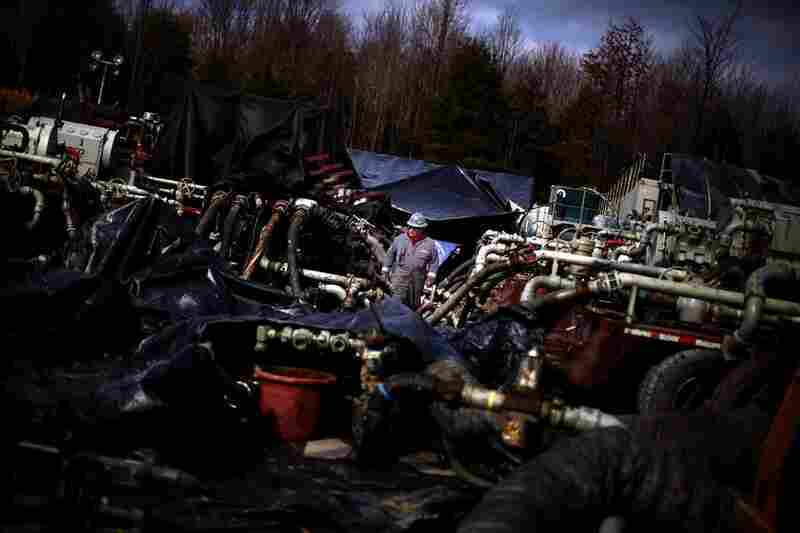 Millions of gallons of fluid help crack open fractures in shale, releasing trapped gas. Chesapeake Energy Senior Director Brian Grove says the industry should have warned people about the messy impact of fracking. 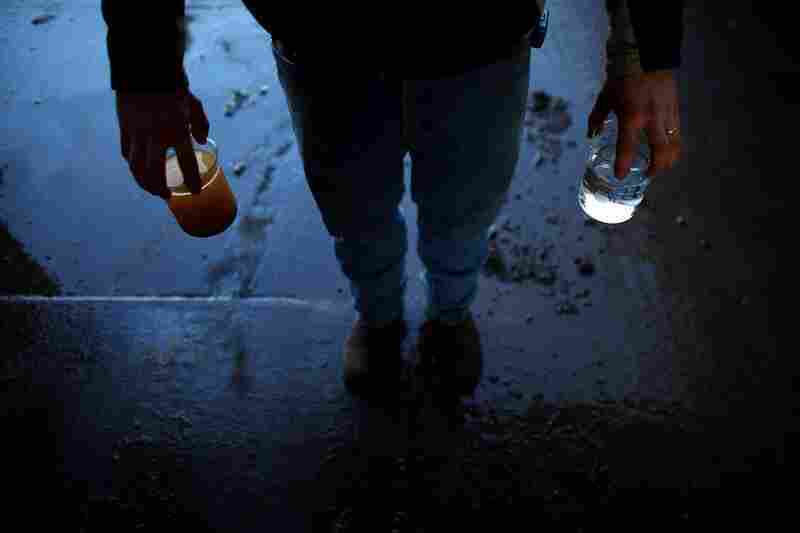 A worker at Eureka Resources, a recycling plant, holds a container of purified water (right) and wastewater from a gas well (left). A worker crosses over a water-holding and skimming tank. 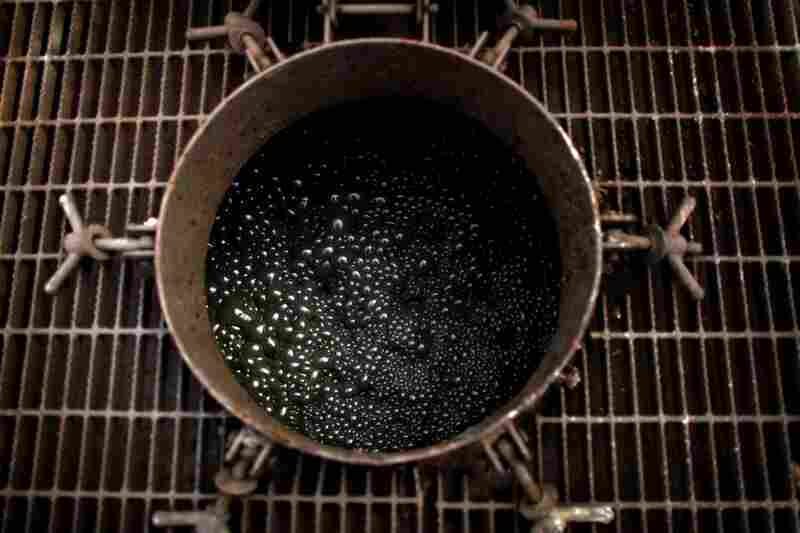 In 2008, Eureka modified its technology to clean up the peculiar mix of gunk in frack water. Plant owner Dan Ertel says new regulations over the disposal of polluted water have brought more drillers to his water treatment facility. 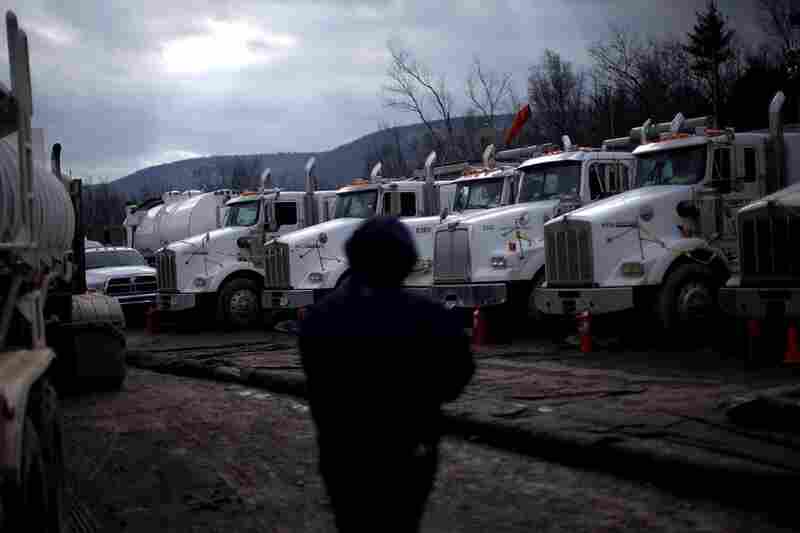 Currently, drillers in Pennsylvania reuse about 90 percent of their fracking wastewater to frack new wells. Trucking is one of the most expensive parts of fracking and companies are looking to replace some transport routes with pipelines. In Pennsylvania, there's an industrial revolution going on. Battalions of drilling rigs are boring into the earth to extract natural gas from an underground layer of shale called the Marcellus formation. Rocks on the shore of the Lackawanna River in Duryea, Pa., are discolored by iron oxide and sulfur compounds — pollutants left behind by past coal mining in the state. And as the wells multiply all along the western end of the state, people worry they may be facing another toxic legacy. The first one came from coal mining. All over the state, you can see bright orange rivers and streams. 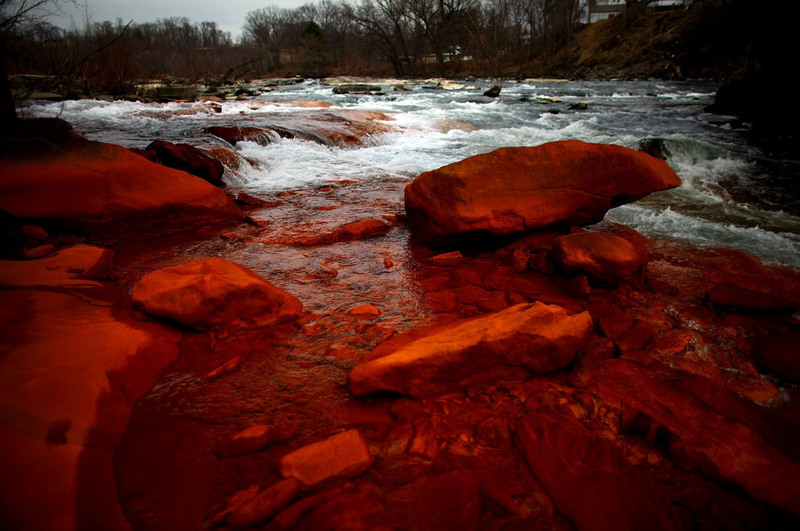 The aquatic life was killed by acidic runoff from abandoned mines. "Are we really going to let this happen to Pennsylvania again?" asks David Yoxtheimer, a hydrologist at Penn State who grew up here. "Are we going to make sure that we have enough money and that these companies' feet are held to the fire to make sure that once their operations are done, they put everything back together, tidy it up, and make it look like nothing happened there in the first place?" Progress isn't always pretty. 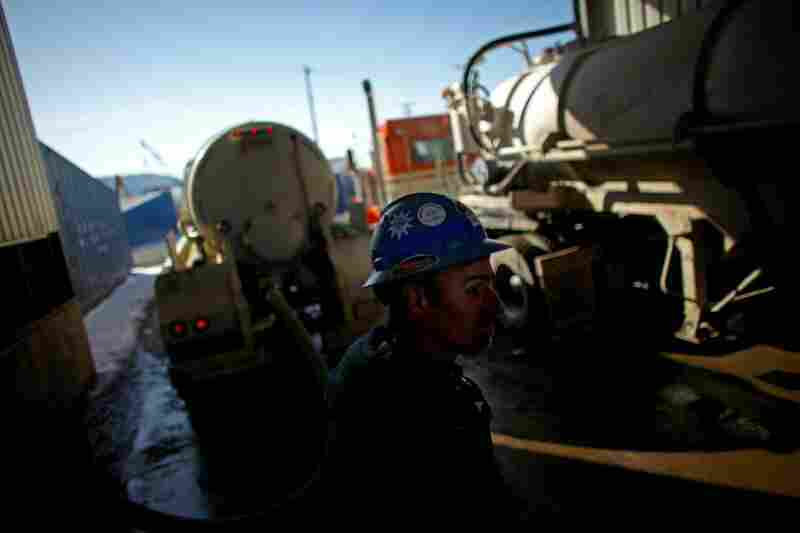 In the natural gas boom, a lot of the ugliness has to do with water. Drillers need billions of gallons of water. It's their dynamite: They use it to split rock. And they need trucks to move that water. Everywhere you drive in Pennsylvania's gas country, you're stuck behind a truck. You get mud all over your car. One-stoplight towns have traffic jams at noon. Dan Lopata, who's in charge of water for Chesapeake Energy, says trucks are a pain for everybody. "The transportation of all the fluids is probably our biggest expense, and that's our highest exposure to the local community," says Lopata. "That's what they see driving up and down the road are the trucks." I asked Lopata if those trucks annoy local people. "I would say yes to that question," he replied. I visited a Chesapeake Energy well site in the northeast part of the state; it was half the size of a football field. Machinery and workers were everywhere, all surrounded by forest. Deer in the woods, and John Deere on the pad. 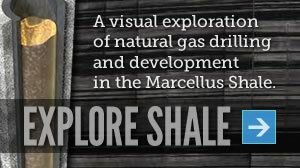 To get the natural gas out of the Marcellus layer of shale, engineers drill about a mile deep, then out horizontally through the shale layer. 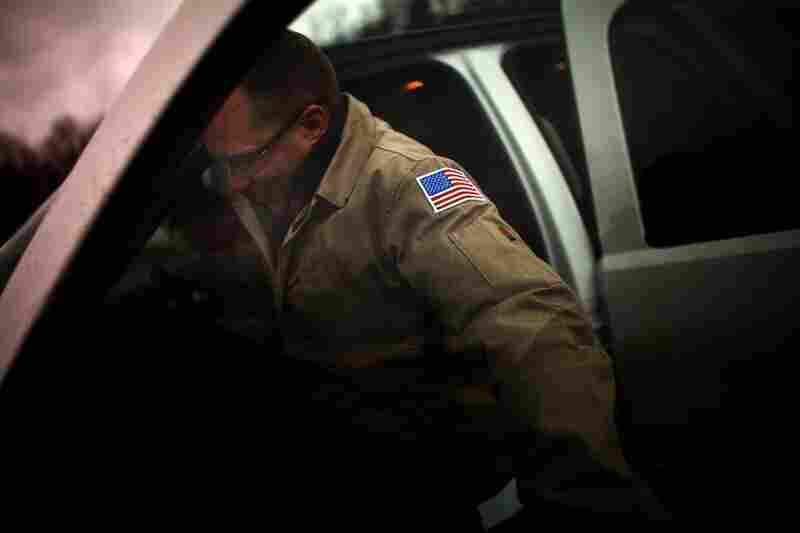 Explosive charges create cracks in the shale. Engineers then mix water with sand and chemicals. Big pumps drive this slurry down into the shale. The fluid is so highly pressurized that it opens the cracks wider and liberates gas. What comes gushing up is called "flowback," a bubbly mix that looks like muddy champagne. Chesapeake senior director Brian Grove points to the 12-foot-high steel well head that's attached to several big hoses. That's the plug at the opening of the well where gas will emerge. "It will come up through the well head," he explains over the din. "We will then put it through a large-scale separator, which will send water in one direction into steel tanks to be recycled, and then the gas will go in the other direction." What To Do With Toxic Wastewater? Flowback is nasty stuff. Grove explains that the water has been exposed to what once was a seabed. "When you expose fresh water to it, you absorb the salts. That is something you don't want to spill on the surface." Besides salt, the water picks up minerals that had been buried in the rock, some of them toxic and some radioactive, like barium. And it still contains some of the chemicals that engineers add to the frack water, some of which are classified as toxic as well. This wastewater flows back up out of the well for about a month, but the well will continue to regurgitate a salty brine for years, which has to be collected and disposed of. How the industry handles this wastewater is a controversial issue. 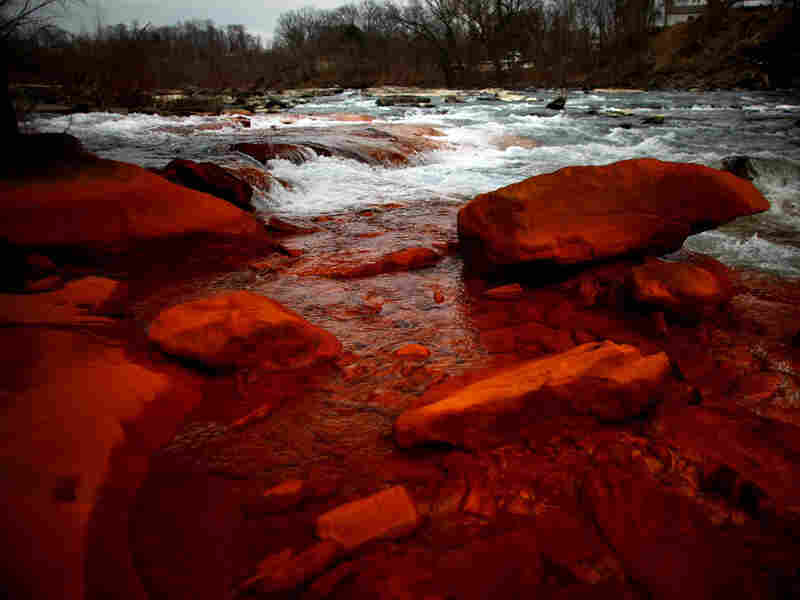 For a while, the wastewater was dumped directly into rivers, untreated. Some drillers shipped it to municipal water treatment plants, which weren't equipped to handle the toxic material in the waste. A current practice is to pump it temporarily into man-made, lined holding ponds. But some of those ponds have leaked. Trucks leaked wastewater as well. And there are the claims, most noticeably made in the HBO documentary Gasland, that backyard drinking water wells were being polluted by drilling. Grove says the industry should have warned people about the kind of mess fracking can make. "I think the biggest mistake the industry made early on in Marcellus development was just remaining silent," he told me. "I think the industry as a whole has, for 50 or 60 years, operated largely in Texas, Oklahoma, Louisiana. The folks that moved east were people that were not used to having to explain themselves; they were used to being understood." So, under a lot of public pressure, the state Department of Environmental Protection cracked down. Since 2008, the DEP has tightened rules for holding ponds where frack water is stored, to keep them from leaking. Another big change was to tell drillers to stop running frack water through public water treatment plants. 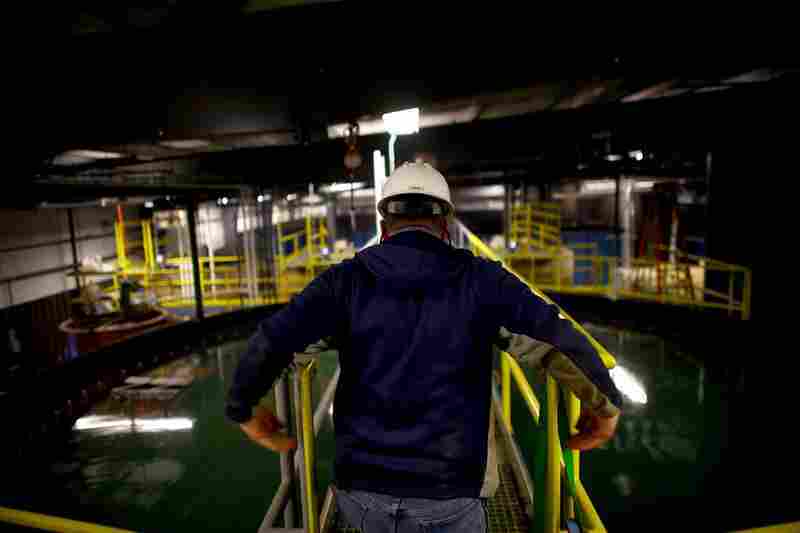 These rules helped create a new business: recycling frack water. Cheseapeake Energy recycles its frack water itself, but other companies send their wastewater to recycling plants such as Eureka Resources in Williamsport, Pa.
Eureka is in an old brick factory next to the Susquehanna River. The first thing you see are water trucks pumping polluted frack water into tanks. I put on a hard hat and went in to talk with plant owner Dan Ertel about this new business. "We saw an absolute lack of any water treatment businesses or companies here," Ertel says. So in 2008 Eureka modified off-the-shelf technology and set up a factory to clean up the peculiar mix of gunk in frack water. The gunk is solid material like dirt, but also minerals like calcium, barium, sulfur compounds and others pollutants. They also remove any radioactive material that might have come from the shale. 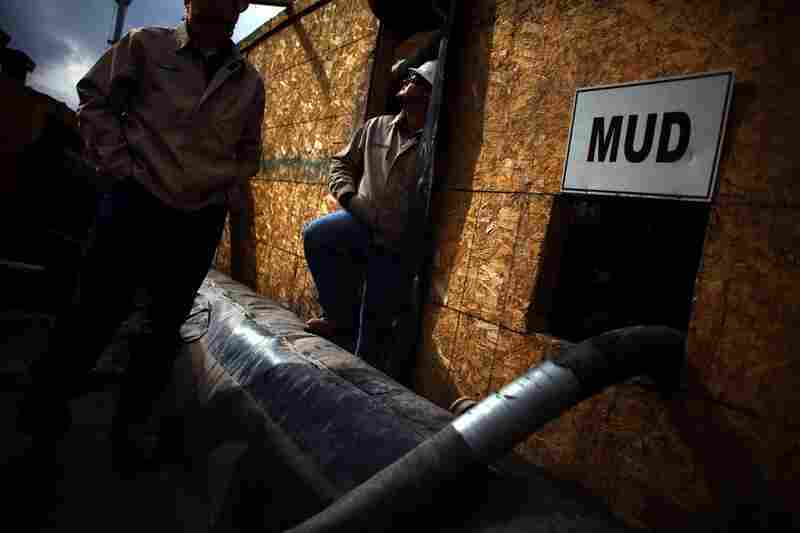 Then drillers take the water — still too salty to go into rivers — and use it again to fracture shale at another well. What isn't recycled goes to waste wells in Ohio or into holding ponds or steel tanks in Pennsylvania. The solid material left over is shipped to landfills, as regulated by state law. Ertel says now that they can't dump water in streams, more drillers are showing up on his doorstep. "Basically what we're seeing is, we're seeing a gradual, controlled but necessary crank-down of regulation," he says. Ertel says his company can also put frack water through a more rigorous process so it can go back into rivers. But that costs more. For now, about 90 percent of frack water is recycled in Pennsylvania and then re-used in fracking. That's an improvement. But that recycled water still requires more trucks to haul it around. Marty Muggleton says it's time to fix the truck problem. Muggleton is vice president of TerrAqua Resource Management, another recycling company in Williamsport. "Nobody likes them," he says of the trucks. "And nobody likes to pay for them. The communities would like the least amount of truck traffic. The operators would like to allocate the least amount of money to support truck traffic." Muggleton's company is designing centralized water treatment facilities closer to fracking sites, and pipelines that would replace water trucks. But no matter how it's moved, it's inevitable that water is going to get spilled. Since 2008, more than 5,000 new wells have been drilled in the state. Those wells have brought with them more than 700 violations of state law related to water, with fines totaling over $1.5 million. And spills tend to take place out of sight — at frack pads up in the woods, or at recycling plants. People worry about what they can't see. Andrew Gavin (left) of the Susquehanna River Basin Commission checks the readings from a device set up to monitor water quality at Gray's Run stream, near Williamsport, Pa. So scientists are trying to see for them. One of them is a hydrologist, Andrew Gavin. He works for the Susquehanna River Basin Commission, and the day I met up with him, he was at a very nice trout stream called Gray's Run. It's surrounded by forest — and a frack site. As we pulled on waders, Gavin explained what the commission was up to. "What we're doing in this monitoring project is really establishing what the general health is of the streams, so we can measure if there any changes in the quality of the water." 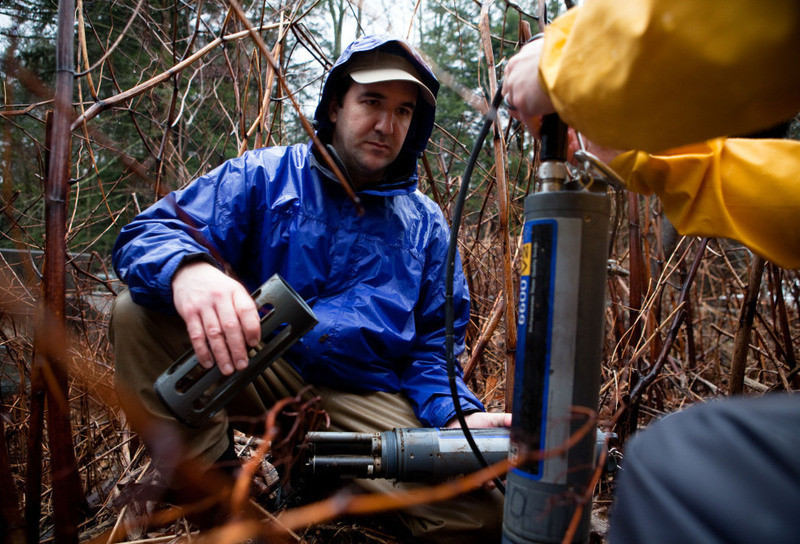 Gavin and his team regularly take "grab samples" of stream water near fracking sites. The commission has also planted battery-powered monitors in over 50 streams. If something unusual gets in the stream, their computers in Harrisburg alert them. There are other groups in the state monitoring stream water around frack sites as well, employing both volunteers as well as scientists. Over the past four years, the water used for fracking has won more protection. But scientists say they need to be vigilant. Frack water chemistry, for example, can be surprising. Water engineer Jeanne VanBriesen at Carnegie Mellon University points out that bromide in frack water behaved in an unexpected way when it went through public water treatment plants. It reacted with chlorine to create compounds that were potentially hazardous. "We're not omniscient," she says of water scientists. "We can't see everything, and sometimes there are downstream effects, particularly ones that involve the waste systems that interact with each other." VanBriesen also wonders about what happens to all the frack water that's left underground. Pennsylvania is already a pin cushion. Oil and gas drilling has gone on for over a century here, long before fracking arrived. "There are lots of holes in Pennsylvania," she says. "Knowing where the old ones are is very important when you're putting in a new one." George Jugovic Jr., who runs the environmental group PennFuture, says the location of a lot of those wells is unknown. "We have over 300,000 oil or gas wells that have been abandoned," he says, "that are out there somewhere, that have not been properly plugged and that can serve as conduits for contamination to migrate up into existing groundwater." Brian Grove of Chesapeake argues that it's unlikely that the water left behind in the Marcellus shale layer could ever contaminate groundwater — it would have to travel upward at least a mile through rock. But a study by the Ground Water Protection Council of fracking water in Texas and Ohio found that water used in drilling has in fact come back up through old, unplugged wells. Yoxtheimer, the Penn State hydrologist, says fracking has been a "lightning rod" for the nation's environmental movement. 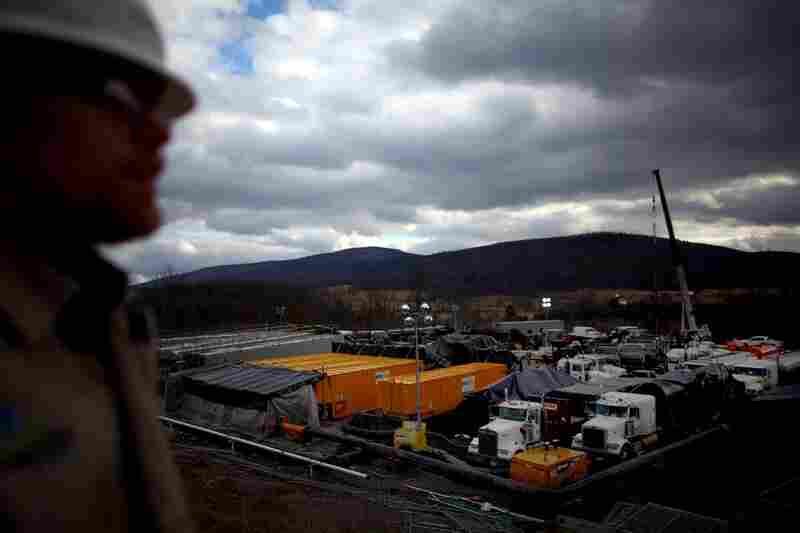 And he says Pennsylvania, like it or not, has been a case study for other states, like New York, that are weighing whether to allow hydraulic fracturing. "I think it's been very interesting to watch the industry change its practices because of public pressure," he says. Pennsylvania's government appears to be listening. There's a new law that charges a fee for each well drilled. The fee is not as high as some wanted, but it should generate millions of dollars for Pennsylvania and the counties where drilling takes place. And the state has also raised the bond amount that companies must post to cover the costs of cleanup once they've left.